Animal sounds galore will make this a good book to read aloud. Also love that the robot seems to end the book still confused about what says bark, yet perfectly able to communicate – an important lesson that imperfect English doesn’t preclude friendship. Ironically, “be more specific” is the most uselessly vague criticisms my students seem to get about their writing. I am tempted to give them official permission to growl at the next person who says it to them. When I ask new (English-fluent) students how they could improve their first piece of writing for me, 90% of them say they should have used more details or been more specific. And when I have followed up with, “What do you mean by that? Can you show me an example of what you would change?” only ONE student has ever actually known how to make such a change. One. It breaks my heart to know all of those kids have taken the criticism to heart without any understanding of how to fix it. They must feel such impotence. So what can a parent do to help their child? Think about what led you to say, “Be more specific” and discuss that. Do you not have a good mental picture of the setting in your mind? Are you confused about the order of events? Are the words repetitively boring because everyone “goes” and “says” and “is” but never does anything with any other verbs? Be able to point to something specific in the text as an example and explain your problem. “It says here that she’s driving. I imagined a car because that’s the most common but in the next paragraph the story talked about ‘closing the back gate’ and I realized that what I was imagining was wrong.” “I know there are three sisters but you don’t tell me their ages so when you say ‘the oldest one,’ I’m not sure who you’re talking about.” After being specific, ask the kid to look for any other places that might confuse someone. Even better, instead of criticizing the work (because, oh, we make writing such a mysterious game of “guess what the adult is going to dislike this time” and just being appreciated sometimes is invaluable in creating adults who don’t hate writing), give them confusing texts themselves to read and ask them what the author could have explained better. When you are reading aloud to your child, pause sometimes if you could *reasonably* misinterpret something unspecified and talk about what the author could have said instead. If you are reading picture books, say “I sure am glad that picture shows that the old woman whispering hush is a rabbit, because the words by themselves would not give me that detail!” When you are reading to yourself and see a sentence with great details, share it out loud with your family. “I love how this book describes the ocean. Listen to this…”. If we want kids to be specific, we have to start by being specific ourselves! I’m in the Twin Cities for the next four days to attend the National Council of Teachers of English annual convention. I’ve spent the last few weeks pouring over the hundreds of workshop descriptions and lists of author signings. Every moment has a half dozen different things I want to do! Most of all, I’m really excited for the many opportunities to learn. Students, thank you so much for letting me reschedule your classes this week. When I see you next week, I’ll have lots of fun ideas for our time together. Boston Book Fest is this weekend! Boston Book Fest is this weekend. I’ve gone for the past four years and loved it every time. There are amazing author panels, kids activities, food trucks, and a crowd of people who love books. After the presentations, authors are usually available to sign their books. When the crowds get to be too much, I find a seat in the Boston Public Library’s courtyard (I hope it will be warm enough tomorrow) with a snack and a notebook, and write down all the inspiring thoughts that are buzzing around my head. Because of my work as a tutor – and because I love children’s literature best of all – I tend to focus on the kids’ and teens’ activities. This year, Louis Sachar and Libba Bray are presenting at the same time and I can’t figure out which presentation to go to. Help! September 19 is Talk Like a Pirate Day. It’s fun and easy and a little bit weird (that’s a good thing) – you just try to talk like a pirate. Step 1: Greet people with “Ahoy!” If the inventor of the telephone got his way, this is what we’d be saying every time we answered it. Step 3: Growl a lot. Say all the regular things like a grumbling, rumbling animal…or like someone who has been stuck on a boat with no microwave oven, no television and *gasp! * no showers for a couple of months. Quite seriously – we love Talk Like a Pirate Day. The American “R” sound is one of the hardest for English Language Learners to master, and being in Boston doesn’t help since locals often drop it, too! Some experts think the pirate accent comes from an actor who was cast as a pirate in several movies. He used the accent from southwest England, where many pirates in English history came from. You can also hear a strong R in Irish speech, but many other regions and many other languages give that letter a different sound. So today’s fun “holiday” is a great opportunity to practice this tricky bit of American English. This is the kind of difficult questions our students need to answer. No, seriously. Yes, it’s a silly question, and the answer doesn’t really matter, not the way that we think the answers should matter at school. The student could answer “a Kia” or “a mo-ped” or “a Maserati” and none would be better than the others. What matters is being able to answer the question in the first place. There are a couple basic words to know – the nouns car and turtle, the verb drive, and the what that tells us it’s a question without a yes/no answer. But then it gets weird. Research has found that language learners who are comfortable with ambiguity do better than learners who want to know everything for sure. In human conversation, we can’t always know exactly what the other person means. If a friend asks How are you? are they just being polite or do they really want to know that your car broke down yesterday and you’re not sure how you’ll get to the dentist’s office today. When someone says I love snow! while shoveling out another 18 inches of the stuff, are they being honest or are they jokingly telling you exactly the opposite? We want our students to know what they don’t know, and to be okay with that. We want our students to make their best guess sometimes, and to sometimes stop and ask for an explanation. We want them out in the world, using the language as they study it, without waiting a decade or two to perfect it. Prepared answers are an important first step. But they aren’t enough to really use the language in the wild. So when we ask a student what kind of car a turtle should drive, we are asking them to think of an answer right that moment, sifting through the English words they know (apple, sad, tomorrow, moped) and pick the best match. We are preparing them for the new friend who greets them with How’s it going? instead of How are you? or for the store employee who interrupts their grocery shopping to ask, Do you want some chorizo? Updated: After I wrote this, I saw a new TED Talk by one of my favorite authors, Mac Barnett, who writes books about city-crushing science projects, lions who eat their illustrators, and the disadvantages of having a pet whale. Talk about silly! And he does – delightfully, but seriously. Silliness may be the fun part of educating children, but it has an important role in their development. So take a few minutes to watch the video and let an extremely talented writer convince you that leaving phone messages for a blue whale is a pretty good idea. Seriously. Comfortable, casual conversation is one of the hardest skills to master when learning a new language. All the workbooks in the world can’t prepare you for the sudden changes in topic, the use of slang and idioms, or just the personal choices your conversational partner might make. Unlike when you’re reading, you can’t always pause a conversation to go look up a word in a dictionary (but when possible, try to ask the person you’re talking to what they mean). And since casual conversation is important for all students, children and adults, to feel like they are fitting in to their new community, we urge our students to take every chance to practice. But talking to strangers as practice for talking to strangers can feel almost impossible – if you felt comfortable doing it already, you wouldn’t need to practice it! 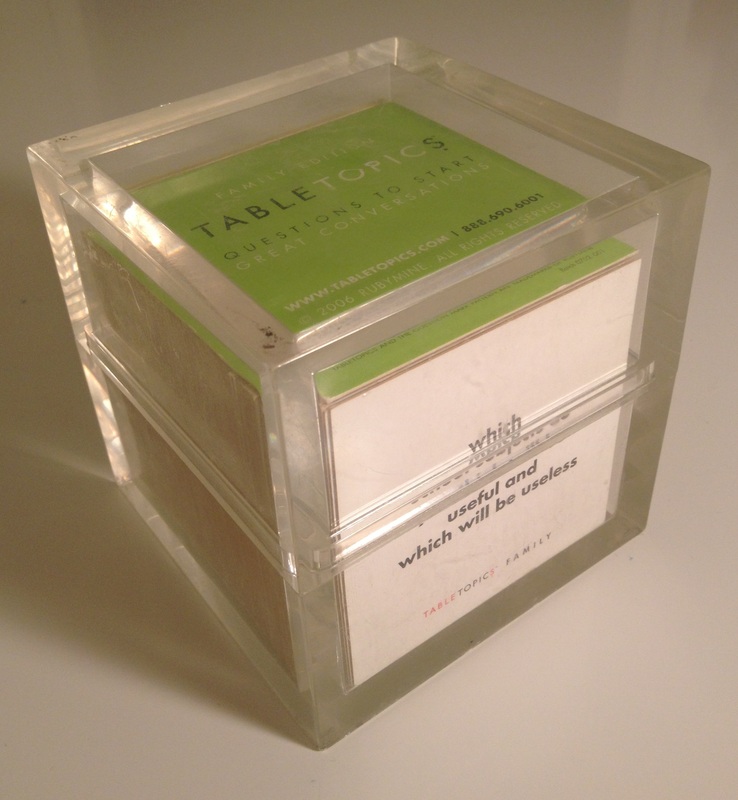 Our copy of Table Topics is getting as well-used as our dictionary! This is why families and friends are so valuable: they already know you are not perfect but they still like you! If you make a game out of your conversation with them, mistakes become part of the fun. Family dinner is a good time to use this game. Some questions have simple, one-word answers, but when people are comfortable they can spend time explaining why that is their answer. You can answer questions in English to practice the language, but even discussion in your home language will help children practice the thinking skills that they need to learn and use English. Be silly, don’t be perfect, and maybe you’ll learn something new about the people you love! 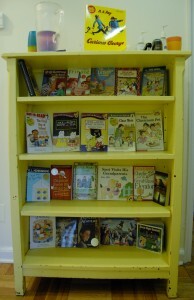 The yellow bookshelf is ready for back-to-school. 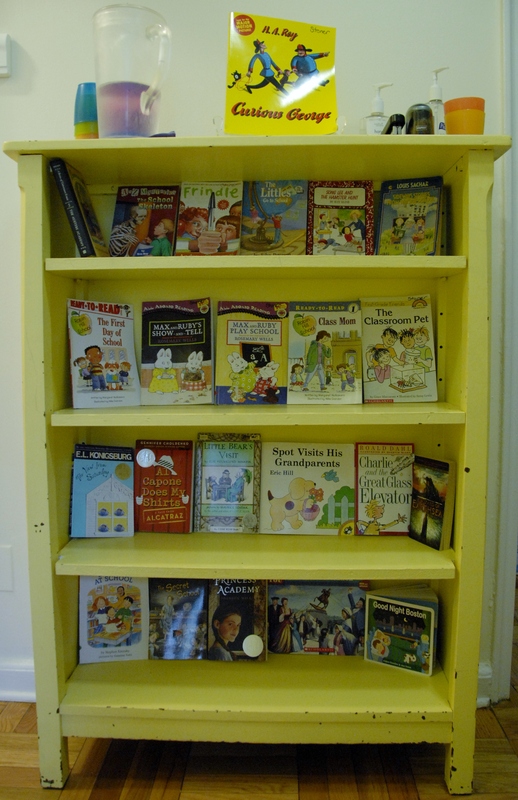 Our back-to-school books are up on the yellow bookshelf, along with other books celebrating special events which happened in September. Students who are starting school in the US for the first time may especially benefit from seeing the similarities and differences (mostly similarities!) between the school they were in before and the typical American school.